I FINALLY bottled the Fool Circle Linvilla Orchards Hard Apple Cider. This beverage was originally made on October 22, 2005. Today it was bottled, and in approximately 2 weeks it will be ready to drink (October 26th). This is my first hard cider and if this goes well at tasting time you know I’ll be back up at Linvilla to buy some more cider. Why such a long wait from start to finish? Well I was “told” by different sources to not even bother tasting it for 6 months and it would only get better after a year. Plus I was told to bulk age it as that makes a difference. One problem I was having was the cider would not fall clear. I finally found a product called Super Kleer KC Finings that cleared the cider like crystal in less than 24 hours – way faster than 12 months. Unfortunetly this picture does no justice for the clarification. The clarification was suspended because I added more yeast at the time of bottling while adding my priming sugar. I do not know, but assume, that there were no longer any viable yeast left to make carbondioxide to carbonate the beer, so added some nice fresh healthy guys. But, the reason for the picture is to show my final gravity which is 0.098 – below 1! I have never had a beverage fall below 1.000, so this is big. Basically water has specific gravity of 1.000 and ethanol (alcohol) has a specific gravity like .800 or something close, so alcohol is “thinner” than water. 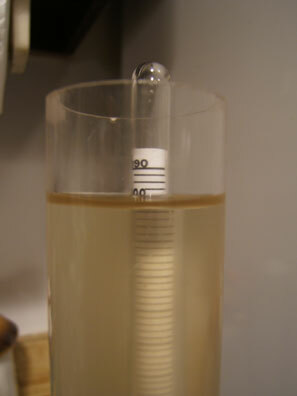 When you brew or make a fermentable beverage like this cider there are sugars in the solution which the yeast feed from. These sugars raise the specific gravity for a solution with sugar is “thicker” than that of water. For my hard cider the orginal gravity was 1.050. So, with an original gravity of such and a final gravity of what we had, we have an expected alcohol level of 6.8% for this hard cider. I know blah, blah, blah – but the (bad) picture shows sort of what I am kind of trying to elude to . . . whatever. This entry was posted on Thursday, October 12th, 2006 at 12:00 am	and is filed under Uncategorized. You can follow any responses to this entry through the RSS 2.0 feed. You can leave a response, or trackback from your own site.